Samsung patent depicts in-display fingerprint sensor; could it be for the Galaxy S10? 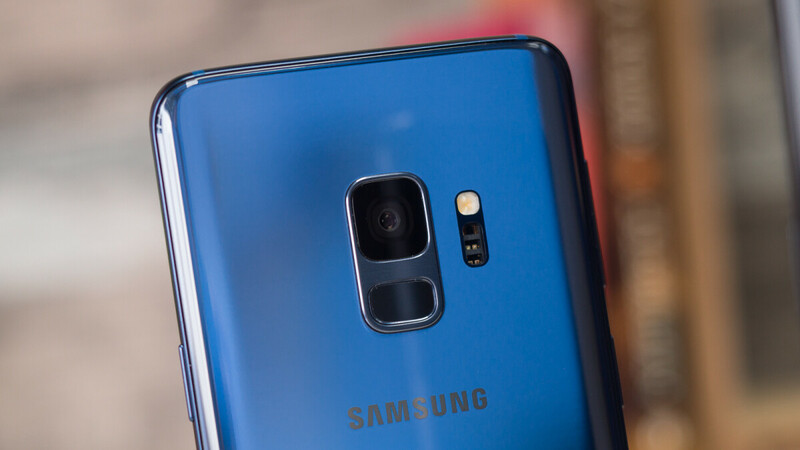 While the Galaxy S9 may have been only a minimal update over last year’s Galaxy S8 in the looks department, Samsung is expected to go all-out with the Galaxy S10 in the hope of improving sales and commemorating the tenth anniversary of the smartphone line. One of the most rumored Galaxy S10 features until now has been an optical fingerprint sensor, as included in Huawei’s Mate 20 Pro and the upcoming OnePlus 6T. And today, an updated patent published in South Korea depicts one possible implementation that could make its way into the flagship. As seen on other smartphones that include the tech, Samsung’s sensor will be limited to just one small area on the display that coincides with where a user’s thumb tends to naturally rest. Much like Samsung’s virtual home buttons, this surface will also be pressure-sensitive, presumably so the phone can inform users as soon as it unlocks, or if the fingerprint detected doesn’t match up. The patent itself does depict the technology inside a familiar-looking phone. However, as this particular application was filed earlier this year – the original one dates all the way back to April 2017 – it likely isn’t indicative of the Galaxy S10’s design. With the company's next flagship set to make its first official appearance in February, Samsung is expected to finalize the smartphone’s design during the months of November and December. Once this happens, a steady stream of leaks will likely commence. Samsung is expected to go all out?? Moving a fingerprint sensor is not really exciting in 2019. Its not as if people are starving for this. A new chip, an improved camera. Maybe slightly faster charging and slightly better display. I fail to see where exactly they will go all out on S10. To quote Ratchet in Transformers: Revenge of the Fallen, "This fool is terribly misinformed!" Rather than giving a quote. Please tell me which part of what I wrote is being misinformed. The article states Samsung is going to go all out. I merely stated that "this" article does not show any reason to feel excited. Every generation of Samsung phones and Apple phones are slightly better than their last crop. I appreciate the improvements, but I just don't think the phones are "as exciting as they used to be". Can future leaks excite us? Sure. Not this. "Moving a fingerprint sensor is not really exciting in 2019. Its not as if people are starving for this. A new chip, an improved camera." Exactly this happened between the S8 & S9 & the sales showed that it wasn't enough of an improvement. Since you said 'maybe' in regards to slightly faster charging & better display, I won't quote that because those haven't really been concerns with Samsung phones. Adding an in-display FPS is going all out as this technology was already supposed to be introduced on the S9, but it wasn't. Wait. You really think the in-display would have skyrocketed the sales of the S9? Its a great feature to have but its still a fingerprint scanner. The only reason Apple Face ID was a success for them is because the phone came with a new form factor, the Face ID does way more things like Animoji rather than just unlocking the phone and also a lot of people felt cool to have these features. "Concerns with Samsung phones"- Why do you think everyone is waiting for the foldable tech. Because people are tired of incremental upgrades since many many years. Its not just Samsung phones, almost every phone manufacturer is going through this problem. I used to see massive performance gains few years back and they really meant something. Now the existing phones are so powerful that the new price tags don't justify the incremental upgrades. Skyrocketed, no. Increased, definitely. It would've shown people that not only did Samsung listen to the complaints of the placement of the S8, but they innovated or did something that very few manufactures are doing right now. Apples changes were welcomed because it's the iPhone & people are gonna buy it regardless & because he previous design was 3 years old. People didn't really care about Animoji at first, but it grew on others. I highly doubt that everyone is waiting on the foldable joint (at least not Samsung's). People are gonna find a way to call it gimmicky (even Android users) until someone else does it. "Now the existing phones are so powerful that the new price tags don't justify the incremental upgrades." This I agree with 100% & is a major reason why I haven't upgraded from the Note 8 to the Note 9. "A new chip, an improved camera. Maybe slightly faster charging and slightly better display. I fail to see where exactly they will go all out on S10." if that is your mentality then no phone released will be exciting for you. and they are putting it under the screen, not just moving it. just touch the screen and your good to go, probably better than any option. But isn't it already a truth that S10 will come with newer chip, improved camera, better display, better battery and probably faster charging? It all depends what phone you are upgrading from. If you are coming from an S9 then it wont be worth the hype. If you are coming from a XS then hell yes it will be worth upgrading to the S10. Please read my comment from the original thread. I am not against Samsung or any phone. And yes, I agree they are moving the FP scanner under the screen. I also feel this might have been exciting 1-2 years back. "if that is your mentality then no phone released will be exciting for you." Wrong, I am super excited about the upcoming foldable Samsung phone. I was very excited about the Mate 20 Pro. And there are others as well. Few years back, the competition was real and intense. Every manufacturer released something different and exciting. These new phones are amazing powerhouses. They work amazing. It is just some peoples opinion that its not a very exciting period. dont get me wrong, i love every phone release, especially when they bring something new to the table, lately its been pretty stale, just slight incremental upgrades but 60% more cost. the only phone right now in the works is the foldable samsung phone, i believe they are going to keep s10 pretty unchanged, and save the true innovation for the folder. So after all that fake hype of Huawei and Samsung using Ultrasonic in display fingerprint scanner from Qualcomm, we are back to both using Optical ones which even a $500+ OnePlus 6T will also have and probably will still be faster than both. How these tech sites made fun of Optical one on 6T and called it inferior one. What say now? It's all rumors but in the end, an optical sensor is still far better than no fps at all. Tell that to millions iphone X, Xs and Xs max user. Based on this patent from points 322 and 323, they're bending the display back to remove the bottom bezel (this is what Apple does). Also according to this patent, the in-screen fingerprint scanner is in between the bent back part of the screen. That's impressive. Exactly. I'm surprised no one else commented on this.